1.Butter a 13×9 baking dish. Mix crumbs, sugar, and butter. Press onto bottom of the baking dish. Bake the crust at 325F for 10 minutes. 2.Beat cream cheese, sugar, flour, and vanilla until blended. Add sour cream and egg replacer mixture and mix the mixture on low speed for 2 minutes. Bake the cheesecake for 40 to 45 minutes, until center is almost set. Cool completely. Refrigerate 4 hours before serving. 3.Meanwhile, bring berries, zest, sugar, raspberry preserve, and lemon juice to boiling. Cook for a few minutes and cool complete. 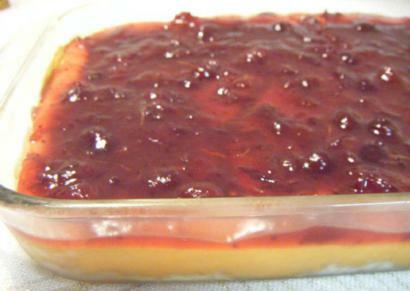 4.Top with cranberry or strawberry filling. If you like, you can use a can of cherry pie filling instead of cranberries.